I don’t really get the taxes on the bottom. The Gold one is “plus tax” but the Rhodium one is “no fed tax”. What fed tax would that be? Was there a federal gold tax? always at hand….to light with….to write with!…. It’s a really new and different gift for Dad! The world’s finest lighter and a superb mechanical pencil are combined in the handsome Ronson Penciliter. It’s finely balanced…it’s streamlined… it’s always at hand for the two things he does most — lighting (press —it’s lit…release —it’s out)…and writing. 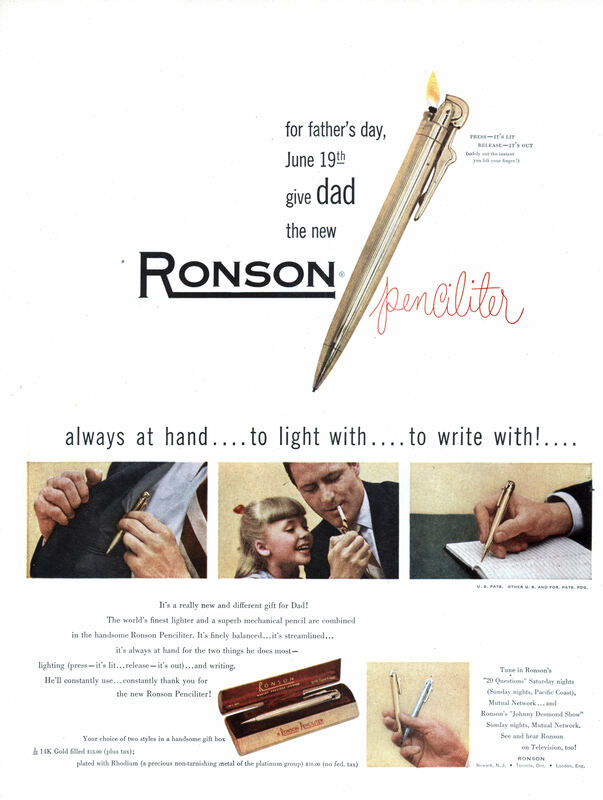 He’ll constantly use., .constantly thank you for the new Ronson Penciliter! Newark, N.J. • Toronto, Ont. • London, Eng. This is perfect for the man who smokes and never makes mistakes in writing. Perhaps there was a companion cigarette case with built-in pencil eraser also for sale. Does anybody else have visions of horrific things happening when the pocket clip snags on something? It would be great for burning up writing that was either sensitive or classified. I love how he’s lighting up the smoke three inches from his daughter’s nose. Get ’em addicted early, Dad! Just the thing to sign the waiver before your lung transplant. When the federal government controlled the gold supply (before 1971) it sold a certain amount for jewelry and other non-coinage purposes. It levied an excise tax on gold used in this manner. I believe that there was a federal “luxury tax” in effect back in those days. I’m not sure of the details, but I suspect that jewelry and precious metals were targeted. Come to think of it, might not be a bad idea for our current crisis! Jewels, furs and luxury cars. Sorry, damn socialists talking. Right now rhodium run about $2000 an ounce and it is used in flat screen monitors and tvs. woofer: Thanks, that explains it! dergutie, The “if you can’t afford something punish someone who can” idea. What would the TSA do if I had this in my pocket? Would they even know what it is? Actually Mike they were trying to preserve the gold standard and prevent inflation. By limiting access to gold it enabled the government to control the money supply stabilizing the value of the dollar and preventing monetary hoarding. In 1949 the US monetary system was operating under the Bretton-Woods System where the exchange rate for gold was fixed at $35 per troy ounce. This allowed foreign governments to transfer gold to the US for a fixed price and reduced speculation that could increase the debts of nations. In 1971 Nixon abolished the Bretton-Woods System in favor of a fiat currency system and since then money has no longer been tied to the value of any commodity. dej- I always wanted a Parker Atomic Pen and I wondered what the TSA would make of that. JMYint, if it says “atomic” on it, and if the TSA monkey manages to read it, you’d lose the pen. i’ll bet money on it.